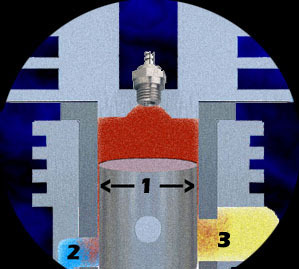 Detail (1): When a sleeve wears out, compressed fuel and air are allowed to "blow by" the piston as seen above. Details (2) & (3): These compressed gases escape past area one, resulting in lost fuel / air during the compression stroke and contaminated / burnt fuel in the lower engine case at the power stroke. Furthermore this effects the scavenging process which is essential in the operation of a 2 stroke engine. Consequently your engine lacks power and runs erratically causing flameouts at the worst possible time imaginable! 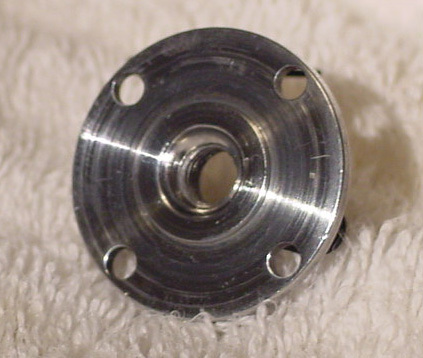 Detail (A): The piston and sleeve with required clearance (360 degrees around cylinder) will seal at the porting windows, and begin to build compression. There should be no physical resistance this area, even when cold. Detail (B): The cylinder bore taper becomes critical from above this area of piston travel in order to contain the increased level of compressing gases and even more to maintain an optimum seal at combustion & power stroke cycle. A very small amount of physical resistance will be apparent until engine is broken-in, and after which should be unnoticeable at operating temperature. Check at operating temp with glow plug removed. 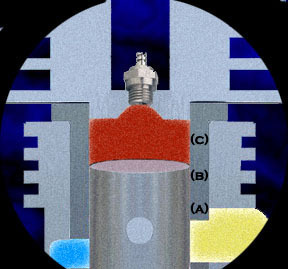 Detail (C): The final 10% of piston travel below TDC establishes the final / most critical seal area. This area is most effected by thermal expansion due to point of combustion generating highest temps. Signs of resistance generally remain apparent for the first few quart fuel after which should be very minimal at operating temp. After a THOROUGH cleaning, blue one surface with magic marker. Do this to either the piston OD or the sleeve cylinder ID. Work parts together a few times keeping the piston inline in its assembled position while stroking in and out a few times. Inspect and find the high spots of un-blued surface evenly lifted to clean surface, illustrating imperfections & lost sealing area. Ideally, all the magic marker should be lifted at and close to TDC which is the key sealing area. We hope that you will find everything you need here regarding our products & services as well as how to get your newly resized engine up and running. RayAracing resizing tooling allows us the ability to accurately compress the sleeve cylinder at three levels. Each level of pinch is controlled and guided internally and externally per RayAracing's tooling design, resulting in a perfectly round & uniform new designed piston to sleeve fit. How do you know when a piston & sleeve set needs resizing? The engine flames out continuously after reaching operating temperature. Constant overheating / cannot maintain normal engine temperature while all else has not changed. Looking at exhaust port and rolling the flywheel over, piston travels well past porting windows before any compression is felt. With piston & sleeve removed, piston pushes well past TDC wear marks on sleeve. Our new order page is online! Get your engines ready for the 2017 racing season!!! Tooling for sale again for limted time! Please see our tooling info and order pages for details on tooling. Be sure to be using raya@rayaracing.com email address when contacting RayA. Thanks! Come see us at the Glenwood GLORICS this weekend in Holland, NY! Look for the RayAracing banner. Updated racing gallery with picture from RC Pro round 1. Check out photos of our new shop! New shop under construction! Tooling orders will not be taken until May 1st. Resizing orders are still being accepted. Added new pictures to racing gallery. Check them out!